Hello, people, Son of L here. I thought I’d point that out for those of you who might not have noticed, since I’m kind of ‘batting out of order’ here as far as posting schedule goes. That’s because Matt’s article from Wednesday had a real ‘To Be Continued’ feel. Our group dipped our toes into Campaign Play, Matt described some of his experiences and promised more to come from me. Now, for regular readers, it’s common knowledge, or at least should be, that Matt and I are part of the same local scene. There’s often overlap in our articles because we’re attending the same events, frequently both play the same opponent (or each other) at an event, and when the group does a special rules event, we’re both building our teams according to the same special rules. But it feels to me, that this week, our articles are even more closely connected than usual. He deliberately left some things unaddressed in his article *cough* Controlling the Bunker *cough*, because I had more direct experience with them. But it seemed like this was an occasion where putting my article up a day or two after Matt’s, instead of four or five, seemed highly desirable. With four possible missions, versatility seemed to be desirable. He’s on the team primarily for the Sapper mission. You want to field Swarm characters early, so that synergizes with the sapper being the first non-Sidekick character I field. Which gives me an unblockable sapper. Not much damager per attack, but the victory points come from how often your sapper goes unblocked, not how much damage it does. Next I decided to think about the Terror Tactics mission. 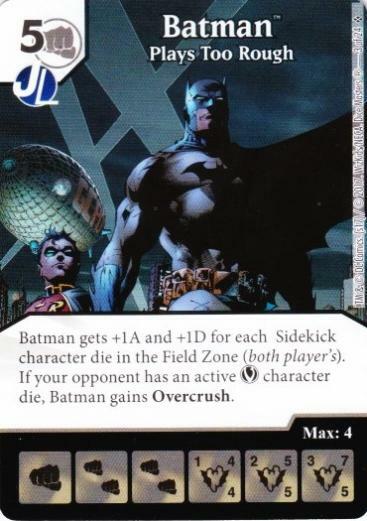 Sidekicks seemed to be the weak point here – they’re characters, and they’re easy to KO. So I decided to address that. First, came WoL UC Supergirl, who gives Sidekicks a +1A/+2D buff. Next, came Jimmy Olsen (I don’t have to specify which one, do I?) so I can get to the 6-cost Supergirl. Get him active, and picking off my Sidekicks with something like Range becomes notably more complicated. SP//dr’s defense isn’t great, given that he’s going to draw a lot of fire, but he does offer important protection for my Sidekicks. as one of my BACs. My Sidekicks are protected, my opponent’s are not. The other two missions are Gather Intelligence and Control the Bunker. For the first, you need attack strength. For the second, survivability. I think I was operating under a misconception when I built this team, and because of that, I put common S.W.O.R.D. Agent on the team. S.W.O.R.D. 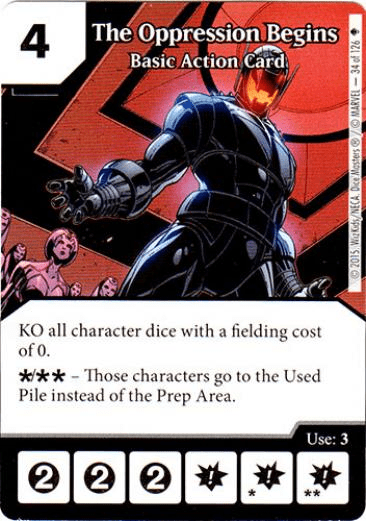 Agent is a 2-cost Ally who gets +1D for every other Sidekick die in either player’s Field Zone. (Note: there is a typo on the Dice Coalition Team-Builder site, where the word ‘other’ is missing – hence the italicization.) I was thinking this would get me some cheap characters with effectively high D that I could use to occupy the bunker, but – well, see below. Mr. Modern PXG went on the team because I wanted Sidekicks in my field. 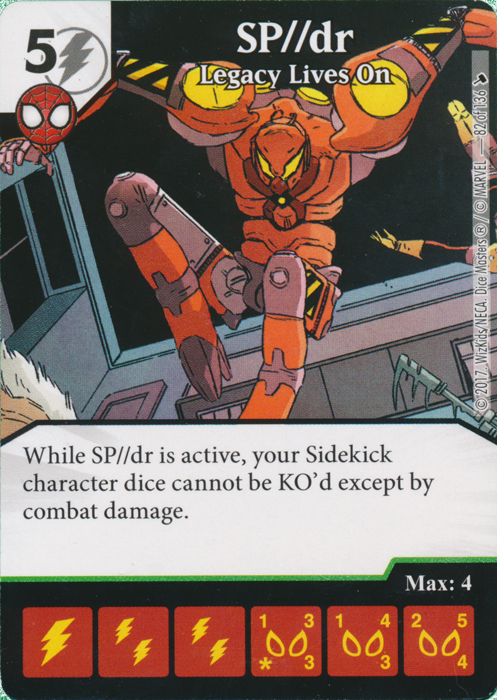 But, actually buying and fielding the die was in my plans, because his ability is to give Sidekicks a +2D buff. And I opted to round things out with Instant War as my other BAC. This opponent’s team was largely Warhammer character, although he was running both Kree Captain and Kree Soldier IIRC. He got the Thunderwolf Cavalry with Overcrush out early as his sapper, and I let it through the first time for 5 damage. I went with Poxwalker as my sapper, of course. It took a while to actually get one in the field, to get both my Swarm and my sapping going. But once I did, I was able to poke him with a Poxwalker quite regularly. I’d gotten a Supergirl and some S.W.O.R.D. Agents out quite soon after the initial Powalker. I had enough D to cope with his Thunderwolf Cavalry – they might have Overcrush, but their A isn’t terribly high. He was only able to get any damage through one time besides the initial Thunderwolf Cavalry hit. 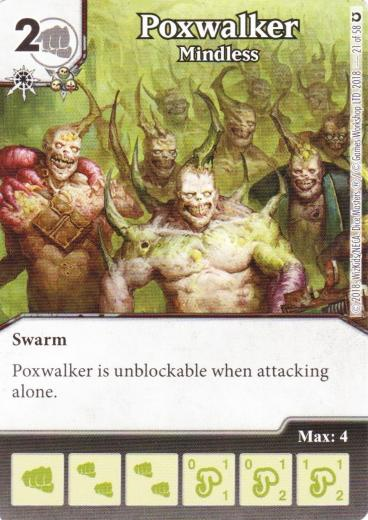 I hit him 7 times with unblockable Poxwalkers. He was still ahead on life, since Poxwalkers only do 1 damage each, but I had 7 victory points to his 2 when it was called due to time. I’m sorry that I need to say it, but this game was a mess. I admit, that when I read the ‘Control the bunker’ rules beforehand, no alarm bells went off. But once we started, playing we quickly realized there are a whole lot of clarifications needed. A die occupying the bunker effectively becomes a third player. Can it be targeted as a character die (with, say the Magic Missile global or Range damage) or only as a player? Dice occupying the bunker are not active, but it wasn’t entirely clear to us what was meant by that? Can they benefit from the character ability on their card? If you have a die in the bunker can your characters in the Field Zone benefit from its card ability? If you have a die in the bunker can it benefit from the abilities of your characters in your Field Zone? At the time, it seemed to us the active player had to choose whether any attack he launched would be aimed at the bunker or the opponent. It wasn’t entirely clear to us whether a defending player was able to block attacks against the bunker, but our best faith interpretation was that he was not. I admit, at the start of the game, my understanding of the rules of this mission was not the same as my opponents. Once we got on the same page, and were both playing the mission to our best understanding of the rules as written – well, tbh, it became an endless unsatisfying loop of 2-player King of Tokyo. My guy knocks your guy out and my guy goes in. Your guy knocks my guy out and goes in. Not to do so was basically giving the opponent a victory point, but with not being able to block for anyone in the bunker, it was nigh impossible to put someone in their who couldn’t be easily kicked out. Oh, my opponent’s team? Warhammer. Venerable Dreadnought. As for the game itself? Between my confusion about how )worked, and some frustratingly poor early character rolls, my opponent got a quick 2-0 lead on the victory point front. Which put me in almost inescapable hole. I could only gain 1 victory point at a time from the bunker. I wasn’t in the best position to attack my opponent, and even if I could get his life total to 0, that would at best get me a victory points tie. This went to time also, I think in large part because we spent a not inconsiderable amount of time trying to figure out how this mission was supposed to work. This was against Matt’s team, which he described in his own article. I got SP//dr out early. Matt kept targeting it with Bolter Drill. I kept re-rolling and re-fielding it. The game lasted awhile. We suspect we either missed the time call or the TO forgot to make one. Anyhow, Matt made a big attack after using Seething Corruption, which totaled my field, but resulted in much of his own field being KOed by my blockers before they went down. And gave me a huge amount of dice in my Prep Area. I wound up with about 6 more dice than he could block. And enough energy to use the Primaris Aggressor global which gives all characters +1A. Since about 3 of my weakest A characters were either Allies or generic Sidekicks and benefitted from the +1A part of the Supergirl buff, I had enough to take Matt down from the 15 life he was at. This is going to be more about the format than the team. By far the biggest problem it the ‘Control the bunker’ mission. I’m pretty sure we did something wrong, but I’m still not sure exactly what that was. Re-reading the mission rules without the ‘keep the game moving’ time pressure, it may be that attacking/blocking was supposed to be handled as normal, and only after an attacker goes unblocked does its owner determine if it’s hitting the opponent or the bunker, but I’m far from certain about that. Since I originally typed the above paragraph, I’ve rewatched the bunker segment of Trubie’s video (embedded in Matt’s earlier post) and gotten some idea of what we did wrong, based on Trubie’s comments at about 8:55-9:00. Which is why I’ve struck through the ‘not sure’ clause. Whether all unblocked dice must attack the bunker? If the answer to 1) is No, can the attacking player have some of his dice attack the bunker while the others deal damage to his opponent? There may be a general problem of ‘runaway leader syndrome’ or at least ‘can’t catch up syndrome’ in a lot of these missions in that once a player gets a lead of 2 or (especially) 3 victory points, the player who’s behind can’t catch up unless the player in the lead plays so poorly it could be described as self-sabotage. Please don’t misunderstand me – I’m not trying to say coming back from a substantial deficit should be easy, but there’s a difference between difficult or even very difficult and (virtually) impossible. The two missions I did correctly (as far as I know) were Sap Defenses and Terror Tactics. They were interesting diversions the first time, but part of me suspects the novelty is going to wear off quickly, in both cases. We made a complete hash of the Control the Bunker mission. That was, I think, in part because the written rules for it at Dice Coalition having a lot of room for improvement, but none of us at our end thought about it hard enough beforehand, and that’s on us. Anyhow, we mangled things so much there that I can’t give meaningful feedback on how well the mission works. If somebody else is confident enough they’ve figured out how it works to give it a try, we’d love to hear how it goes – we have a Comments section for things exactly like that. I did enjoy the format, but there are bumps that need to be ironed out. And even when I’m satisfied that they have been, it’s probably not something that I’m going to be chomping at the bit to do again. But I’m not sorry we tried it.